" A new small rented lease,and cancel the old"
The poet wants redemption. 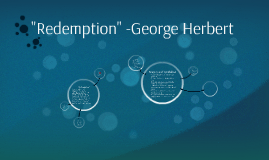 Redemption means the action of saving or being saved from sin or the act of buying back something. A new small rented lease,and cancel the old "
But in his search to heaven he found out that his landlord had returned to earth. Long since on earth to take possession"
In cities, theaters,gardens, parks and courts"
The poet was searching for God forgetting that the son of man does not stay in a place. Jesus said in Luke 9;54 that " foxes have holes,birds have nest, but the son of man has no where to lay his head. Of thieves and murderers,there I him espied ". This is a biblical allusion to the parable of the tenants in Luke 20:9-17. About q man who planted a vineyard and rented it out. He went away for along time at harvest time he sent his servant to the tenants so that they would give him fruits but they beat him. He later sent his heir who they killed. "............ Your suit is granted,said and died"
The same reason by the poet went up is the same reason why the Lord came down. It is ironical that the poet was seeking for his master for redemption whereas the master has already granted his request. The master's death symbolizes Christ's death on the cross of calvary and his redemption. The poet shows God's love and mercy on human race. under what form of poetry can you classify this poem? Would it be an elegy?